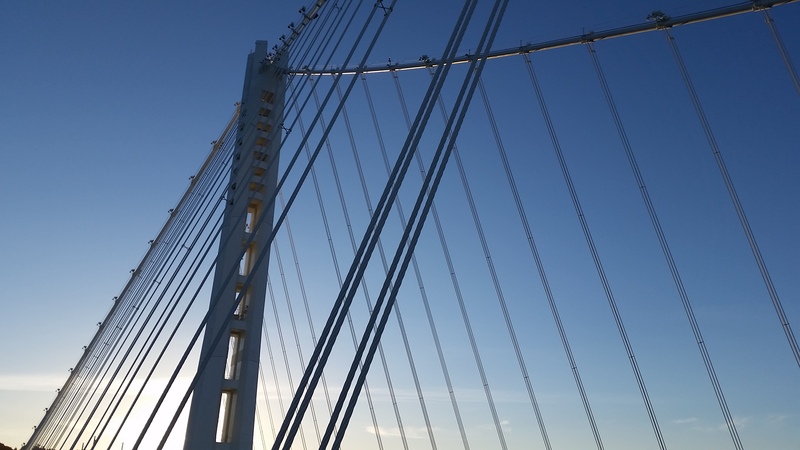 For the first time in history, pedestrians and cyclists have the chance to travel across the new East Span of the San Francisco – Oakland Bay Bridge. Limited five-hour parking is available on the north side of Burma Rd., at the intersection of Burma Rd. and Maritime St. 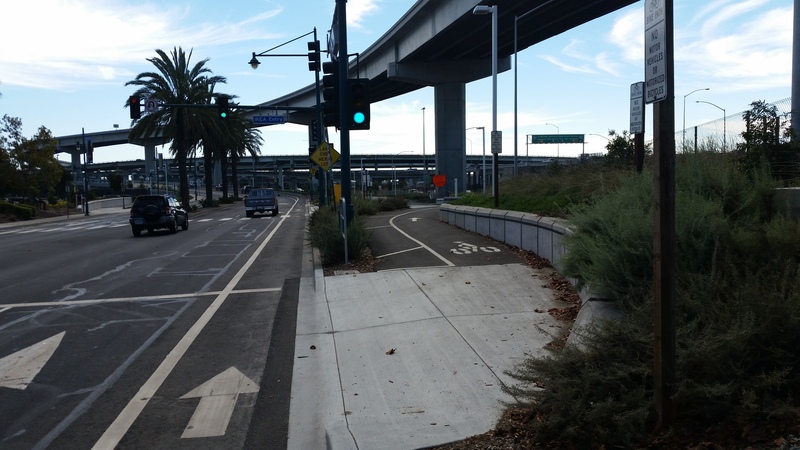 The West Oakland entrance is located off of Maritime Street, a two-lane road without a designated bike lane. The Bay Trail path to this site is still somewhat under construction, so the roads are a bit dicey at times. 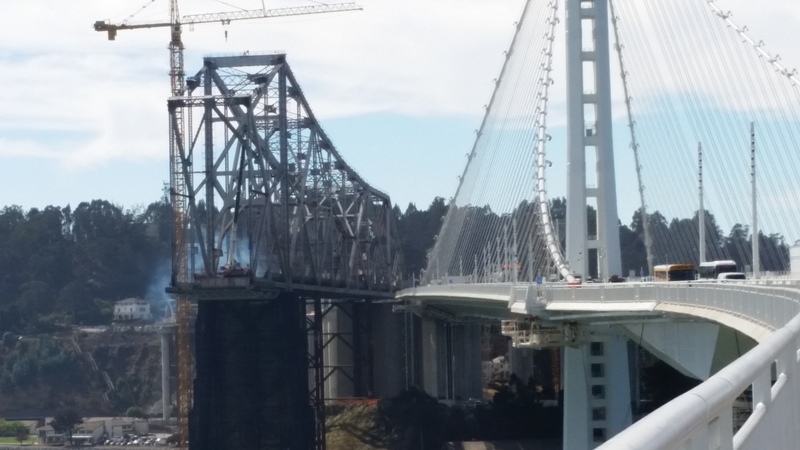 But if you’ve ever ridden through West Oakland toward Shoreline Park, this shouldn’t be a surprise. It’s an industrial and empty landscape, which is at times interesting and others a bit terrifying (this is also a truck route for the port). The roads are not in great condition and there are numerous gaping potholes to watch out for. That said, the road was pretty quiet. To ensure user safety, the 15.5-foot-wide path has one lane in each direction for bicyclists and an outside lane designated for walkers. 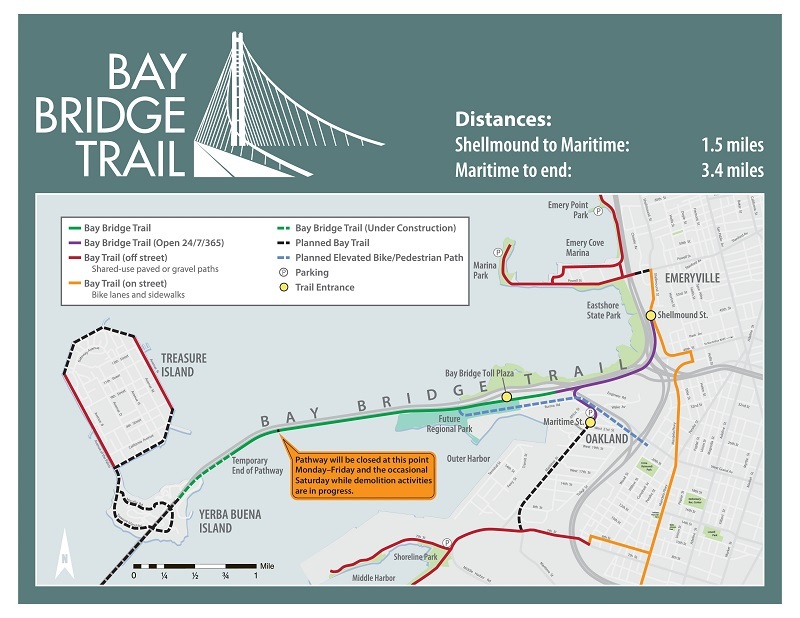 The bike and pedestrian path is named after the late East Bay Bicycle Coalition founder and Bay Bridge Trail advocate, Alex Zuckermann. A plaque bearing his name is located on the trail. From October 1, 2014 until March 15, 2015, the pathway where the Shellmound St. and Burma Rd. 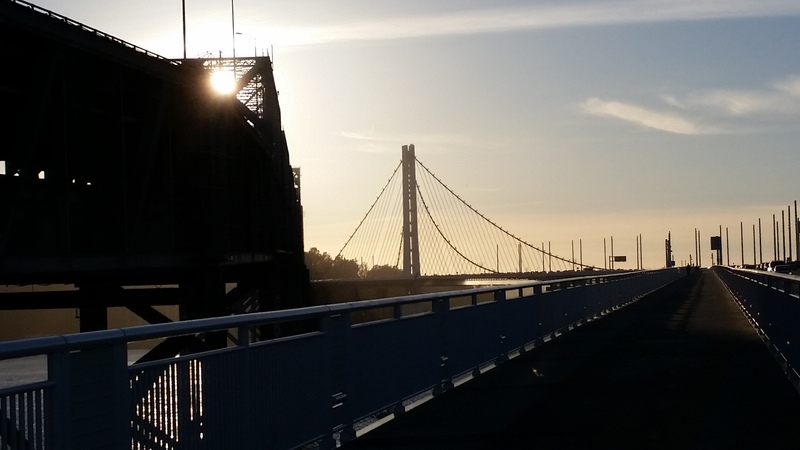 trailheads converge and travel along the bridge will be open from 7 a.m. until 6 p.m. The trail from Shellmound St. to Maritime St. will remain open 24/7. 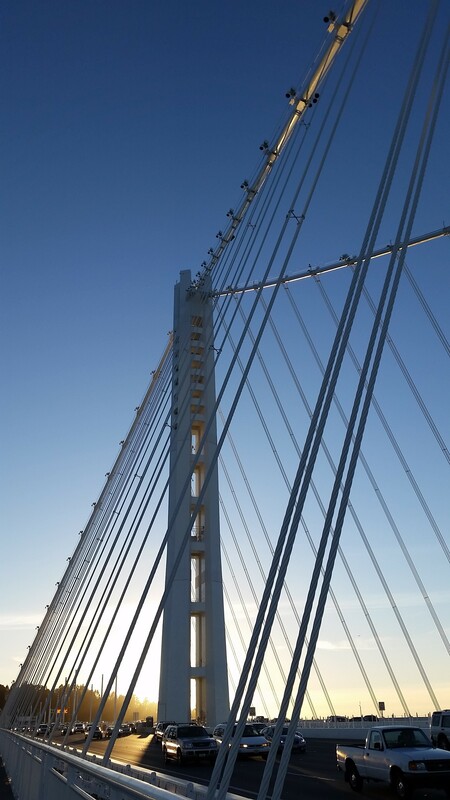 Two-thirds of the Bay Bridge Trail opened to the public on September 3, 2013, allowing visitors to traverse just past the span’s 525-foot signature tower. 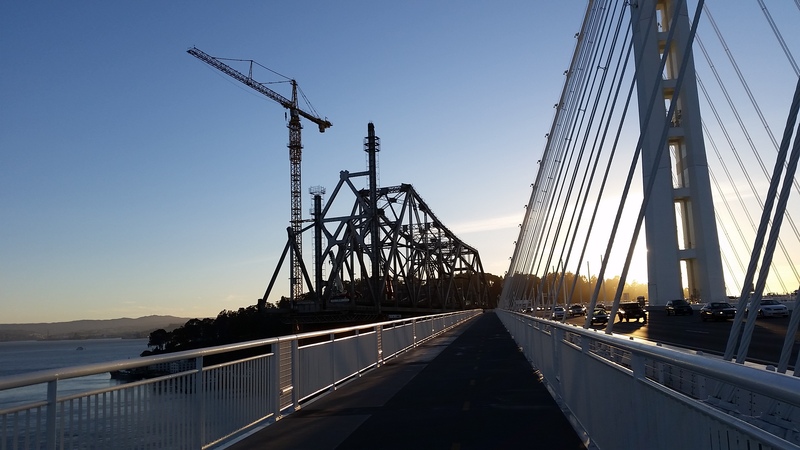 Before the pathway can be extended the 2.2 miles between Oakland and Yerba Buena Island, contractors must dismantle a portion of the original bridge that sits in the way. 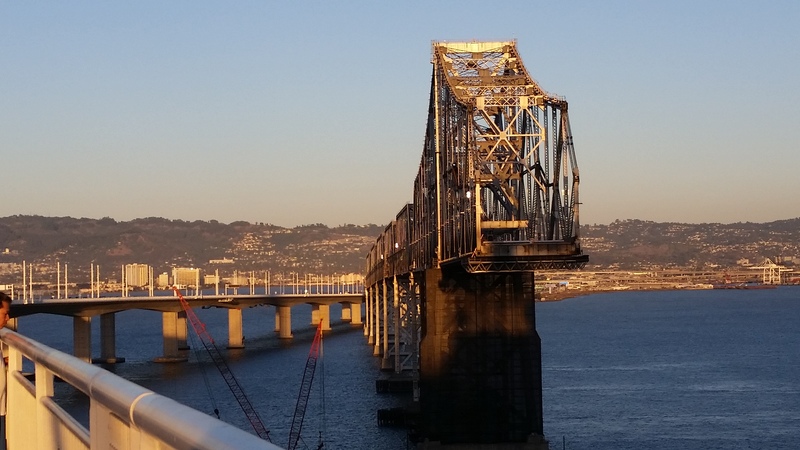 The island connector isn’t due to be completed until summer 2015. 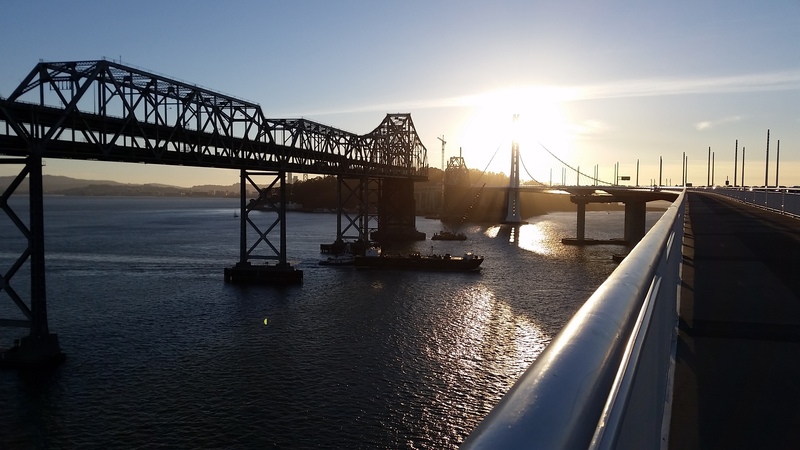 With the east span finally open, planners are already at work on the next mega-Bay Bridge project – a $1 billion-plus makeover of the western span that would include a $500 million hanging bike path. 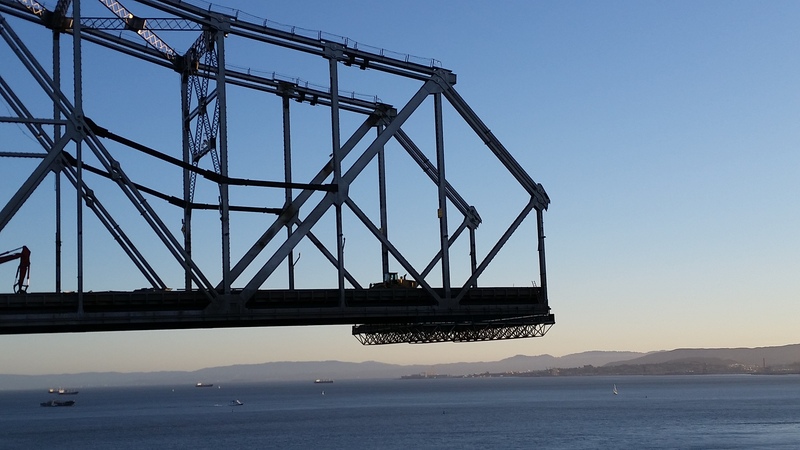 The project, however, has significant engineering challenges. For starters, an MTC feasibility study found bike lanes would be needed on both sides to keep the bridge’s weight balanced. Adding the extra lanes, however, would make the span too heavy. To offset that, planners propose to replace the roadway with a lighter material.